Benjamin shared his germs with Daddy. Daddy shared his germs with me. Both Ben and Daddy feel just dandy. But for me, misery abounds. Michael took the boys to the park, and Benjamin experienced flight when he slipped off the swings at the highest point and came crashing down to earth with a great deal of "sand rash". 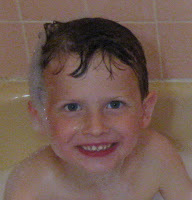 When they returned, he put Ben in the bathtub, to calm both Ben and Ben's angry red skin. 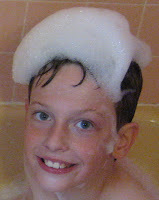 Nathan, our water-child, couldn't bear to see Ben covered in bubbles all by himself, so together they ended up playing in the tub for over an hour while Mike read a book in the bathroom. So even though they didn't get wet from the rain, they spent plenty of time in the water!